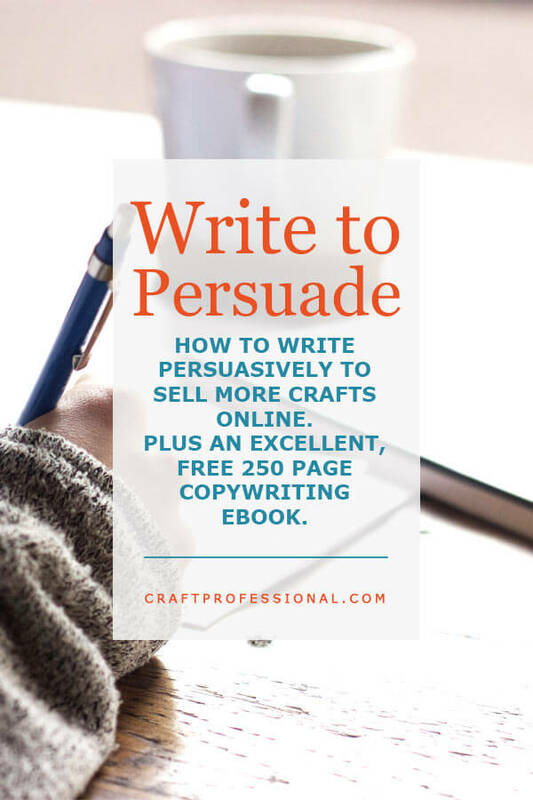 Several of my readers have asked for information about persuasive online copywriting. That is, how to write descriptions or ads that sell your products. Writing to sell isn't all pixie dust and magic. It is an important, and completely learnable skill, that will help you sell your crafts online, and if you go through the process thoroughly, it will also help you talk to customers more effectively when you're selling in person. When I first sat down to write this article I thought, okay, I'm not a professional copywriter, but a good chunk of my work has involved writing to sell, or writing to engage people. Even before I was self employed, I worked as a career coach and wrote over 2000 resumes, which is all about the subtleties of writing to sell. I figured I knew this topic pretty thoroughly. Then, I spent this past week reading the excellent and free copywriting ebook, Make Your Words Sell. I assumed I'd just skim through it for new ideas. Make Your Words Sell is published by SiteSell, the company I use for my online business. They produce exceptional educational materials, so I thought I'd find some good nuggets of information in there. Let me tell you, I didn't skim that book. I read it slowly and carefully with pen and paper in hand to make notes. There aren't just nuggets in the book; it is truly a gold mine of information on persuasive online copywriting. So, let me share with you an overview of writing to sell to get you started, but if you really want to take a deep dive into this information (and I do mean deep - the book is 250 pages long), I would strongly suggest you download and read your free copy of Make Your Words Sell. Above everything else, you need to know your customer and his or her motivations. What problem does your customer have that you can solve? Why does your customer buy your product? What is the best way to talk (or write) for your customer to engage him or her? There are plenty of ways to get to know your ideal customer, and you can do it even if you are just starting out and don't have your own customer base to draw from. You might already know your ideal customer simply from interacting with them and being active in your field for a number of years. You may engage with your ideal customer on social media, either through your own social following or by reading what they are saying on the social pages run by your competitors. You may interact with them or read what they are saying in niche forums. For example, if you make handmade dog collars, you may interact with people who would be your ideal customers on popular dog lovers' social media groups. You might ask your customers directly to find out what their priorities are. Use whichever means of communicating with your customers makes the most sense for you. If you deal directly with customers face to face, really listen to their needs when they talk with you. If you have a regular newsletter, ask customers questions about their needs. In fact, that's how I decided to write this article. I asked my newsletter readers what they wanted to learn about, and several asked for tips on writing to sell. There are plenty of ways to get to know your ideal customer, so make sure you know who you are writing for before you start crafting sentences. Whatever you do, avoid simply copying someone else's words. You see a polished, well presented site or a competitor on Etsy who has compelling product descriptions and is making lots of sales, and the temptation to copy phrases can creep in. The problem with that approach (apart from the un-coolness of copying someone else's work) is that those words describe what is special about the other person's products. They won't necessarily be a true reflection of what is special about your products. Also, if you simply copy elegant phrases, you won't necessarily understand why those words work well for someone else, and they might not work well for you, your customers, and your product. You need to learn what is special about your own products, then write to convey that unique information. Then there's the lists of power words you inevitably find when you search for information on persuasive online copywriting. Lists of power words exist for a reason. They can be effective when used well. But just throwing a bunch of power words into your sales copy won't guarantee success. It could even cause you to lose sales if you lay it on too thick or choose words that don't resonate with your particular customer. A few well chosen power words are fine, but you need to use them wisely. Before you can write well about your creations, you need to take some time to really get to know and understand what is special about your items. How will your ideal customer's life be improved by owning your product? Thinking this way will help you focus on the benefits of owning the product instead of just the features. What problems does your product solve for your ideal customer? How is your product superior to other similar items on the market? Think your product doesn't solve a problem or improve people's lives? Think harder! If your product is more of a "want" item than "need" item you might be thinking it doesn't really solve a problem or improve people's lives. If you really think creatively and deeply about all of the ways customers use your products and their reasons for buying, you should be able to come up with some compelling benefits. My young son started carrying an epinephrine injector because he is allergic to peanuts. The pouch it comes with is designed to attach to a belt, so I needed to buy a kid's belt with a clasp that my five year old could buckle and unbuckle so he could take care of it himself at school. Doesn't seem like a lot to ask for, right? It's bizarre. Most kids' belts have buckles that kids can't operate. Someone is really missing the boat on belts for children! After hours of searching, I finally found a seller on Etsy who made cute belts with clips my five year old can operate. She was solving a huge problem for me; I was completely thrilled! By the time I found her belts, I was so happy, I didn't even care how much they cost (they were fairly priced, but really, it wasn't even a factor at that point). I also shared the link to her shop with other parents of kids with food allergies who were having the same problem finding belts. On the surface, someone might look at her shop and think oh, cute belts for kids. That's a "want" I'd buy if I have some extra cash. But for me, I looked at her shop and thought, oh, the perfect solution that will allow my child to carry his life-saving medicine and still be independent when he is at school. That's a need that I'm going to buy without a second thought and be completely grateful to the seller for solving my problem. So really think about your products. Did you make certain design choices because it was an improvement on products that are readily available? Who doesn't just want your product but needs your product? Within the answers to those questions is where you'll find the language to write to promote your items. This tip is particularly important when you're writing for an online audience. People skim online. Keep your sentences short, include plenty of white space, and use bullet points whenever you have a list. Use sub-headings to draw people through your copy, and help skim readers get the gist of what you have to say. Your headline and first paragraph need to pull readers in. People are in a hurry online, and those first impressions need to quickly tell your customer what's in it for her if she's going to keep reading. Avoid negativity. It is subtle, and negativity can easily creep in, but instead of talking about a negative, turn it around to focus on the positive. So, back to my kid's belt example, instead of pointing out that kids can't undo standard belt buckles, be positive and write about how your buckles open and close with a simple click so kids can be totally independent. Second, the example at the end of the book uses very long advertising copy, which, depending on your product and the situation, may or may not be appropriate for your sales. A customer on Etsy isn't going to expect to read a looong description on the benefits of each of your individual pieces. In that case, you can take the concepts from the book and shorten them up. However, longer copy that gently sells you and your work would be absolutely perfect on an "about me" page, and long copy is absolutely appropriate in some settings. The advice in the book is excellent; you just have to keep those two things in mind to fit the craft selling niche. The book expands on all of the concepts I've outlined. It will help you determine what kind of person is your ideal customer and how to write for that person. It also includes an excellent formula for writing your copy that will help you beat writer's block, and it takes you through the process of creating copy for an imaginary product from start to finish so you can see how it works and apply the concepts to your own products. You can download Make Your Words Sell here and start writing to entice your customers.